AMD has released its latest Vega 20 GPU and Radeon AIB implementation the Radeon VII, a 3840 shader (60 Vega compute units) with 16 GB of HBM2 RAM, for $699. The new AIB uses 300 watts which is 40% more than the RTX 2080 and goes a long way towards explaining why it has three fans compared to RTX’s two. It also has 30% more cores than the RTX. Radeon Vll will modify its clocks dynamically in response to different workloads to achieve the optimal mix of performance, power draw, and thermals. Users can expect to see a broader range of operating clocks and quicker transitions between clock speeds while gaming than in prior Radeon GPI-Js. These transitions happen automatically and should be transparent to the end user, but they will be evident in monitoring tools like Radeon WattMan. AMD says the 7nm process technology allowed them to deliver increased performance, and to shrink the Vega GPU die from 495mm2 to 331mm2, enabling them to add an additional two stacks of HBM2 memory (2X the memory of the Radeon RX Vega 64 graphics card) with up to 1TB/s Bandwidth. AMD Radeon RX compared to the Vega 64. We ran a battery of tests on the new AIB as well as an Nvidia RTX 2080 and AMD’s previous generation AIB, the Radeon Vega 64. For synthetic benchmarks we ran six tests: 3DMark Timespy, FireStrike Extreme, Unigine Superposition 4K, PC Mark, GFX Bench DX 12, and GFX Bench Vulcan. For games we used four programs: Shadows of TombRaider (4K Highest pre-set), Deus EX Mankind Divided (4K Ultra pre-set), Hitman 4K, and Final Fantasy 4K High. We also included 2560x1440 test data for Hitman, Deus EX MD as well and Shadows of Tomb Raider. Averaging the scores of all the benchmarks and games the VII outperformed the Vega 64 by 21% as would be expected, and was just -3% less than the RTX 2080, which was better than expected. However, on the average of the FPS, the VII was only 12% better than the Vega 64, and -16% of the RTX 2080. When price and power consumption are added to the comparison to generate a Pmark, the Radeon VII doesn’t stack up so well. Coming in 40% less than the Vega64, and 27% less than the RTX 2080 using the average of all benchmark scores. Calculating the Pmark using FPS, the Radeon Vii comes in 56% lower than the Vega 64 and 43% below the RTX 2080, as shown in the following chart. At 1440, the Radeon VII came closer to the RTX 2080 in performance score and FPS, as illustrated in the following charts. The larger power consumption of the Radeon VII kept its Pmark score at 1440 below the RTX2080 and Vega 64 in both average score and FPS, as the following charts indicate. We also looked at the difference between the Vulkan API and the DirectX12 API performance using GFX Bench, and found the RTX 2080 DirectX 12 scores to be higher in score and FPS, but the AMD AIBs did better with Vulkan in scores, but mixed results with FPS. The conclusions are for maximum FPS one would want to sue a Vulkan driver with an AMD Radeon VII, if the game supported it, and if the overall score was important then and RTX 2080 with DirectX 12 driver would be the choice. The AIB has an impressive 115 GP/s fill rate, and a peak texture fill rate of 432 GT/s. With regard to the 16 GB of RAM, which some might think is overkill, AMD points out that games are eating more and more RAM every generation, and provided the following table to illustrate the point. AMD further comments about a graphically challenging scene in Far Cry 5 showed frame-time spikes that were much larger and significantly more frequent on the 8GB graphics card, while the 16GB graphics card maintained a much smoother delivery of frames. 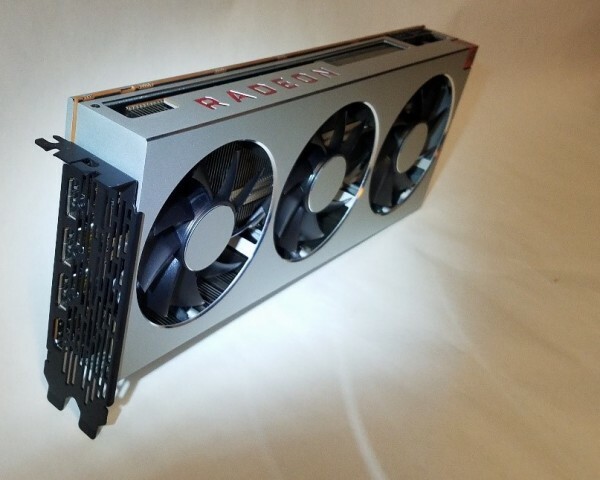 The Radeon VII is a 13.2 million transistor shrink of the 5th Gen GCN architecture with its double precision floating point 64 engine removed, hence it gets almost 14 TFLOPS. The 16 GB of HBM2 is impressive for its size, and speed — 1 TB/s memory bandwidth. AMD puts the VI as 1.3x faster than its predecessor the Vega 64 which isn’t anything we could reconcile in terms of FPS, score or clocks. 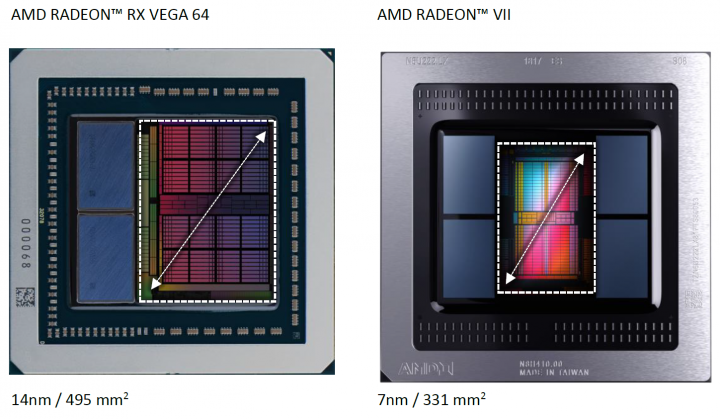 AMD has gotten a lot of mileage out of the GCN generation but it AMD’s heroic work going to 7nm deserves a new architecture; Navi is on the way.